Green Dragon Tavern & Museum, 6115 Paseo del Norte, Carlsbad (760-918-2421). Open daily for lunch 11:30 a.m.–3:30 p.m. ($8.95–$21.95). Happy Hour Daily 3 p.m.–6 p.m. During the week dinner is served from 4 p.m.–9 p.m. and till 10 p.m. on the weekends. 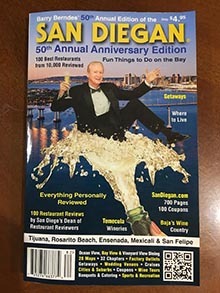 ($11.95–$47.95). Sunday Brunch is served 10:30 a.m.– 2:30 p.m. 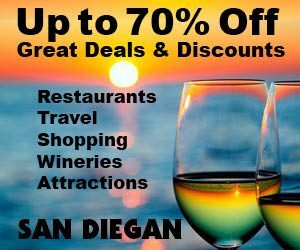 This is San Diego County’s best new restaurant and a must see historical attraction! The Green Dragon Tavern & Museum is a replica of the original revolutionary headquarters of the American Revolution located in the city of Boston back in 1776. And ironically, it was from the Green Dragon Tavern from which Paul Revere departed on his historic ride through the countryside notifying the militia that the “British are Coming!” That being said, this new two-story brick building is a 20,000 sq. ft. architectural masterpiece with the centerpiece being their fascinating American Revolutionary Museum. Everyone who dines here is totally impessed with the musuem and the restaurant, and so will you. For starters the massive size of this two story brick building as well as its striking authentic looking décor and historic documents is well worth a visit. As for the cuisine it’s excellent. Dinner menu favorites include their Loch Durate Salmon with clam and corn stuffing, charred asparagus spears and a savory Horseradish Bearnaise. Another winner is their bacon wrapped scallops! As delicious-tasting as it looks is their impressive wedge salad topped with blue cheese dressing and tomatoes. And no New England inspired meal would be complete without a bowl of New England clam chowder served in a sour dough bread bowl. Great, one-of-a-kind desserts are also served. Visit GreenDragonTavern.com. Food to go. Full bar. Credit cards: AE, DISC, MC, VISA. East of Interstate 5 along a two-block stretch of Paseo Del Norte (see map) is home to a dozen excellent restaurants. Each one is so special that you owe it to yourself to dine in each one. The newest addition to this classy restaurant row is an incredible showpiece called The Green Dragon Tavern and Museum (1). Believe it or not but it is literally 22,000 sq. ft. in size, which is about five times the size of a typical restaurant. And its centerpiece is a fascinating “must see” historical museum devoted to the American Revolution. You’ll see an authentic newspaper that Benjamin Franklin actually created as well as artifacts from the American Revolutionary War. This one-of-a-kind museum is the private collection of the restaurant’s owner. And he chose to create a stunning recreation of the two story tavern where Benjamin Franklin, Sam Adams, John Hancock and our founding fathers frequently met to wage war for American Independence just to showcase his valuable collection. And Paul Revere left his name in history by departing from the original tavern to alert the mulitia sounding the alarm that “the British are Coming”. There is no doubt about it, the recreation of the American Revolutionary Headquarters at The Green Dragon Tavern (1) at 6115 Paseo Del Norte (760-918-2421) should be your first choice for where to dine in Carlsbad. See Restaurants. Both the two story tavern and the comfortable main dining room are excellent dining destinations as well. See Restaurants. Soon after discovering the Green Dragon Tavern, you’ll undoubtedly discover that the rest of Paseo Del Norte is filled with a long list of potential dining destinations as well. A landmark restaurant and market serving delicious breakfast, lunch and dinner is just down the street to the south. It’s Tip Top Meats (1) a European Deli at 6118 Paseon Del Norte (760-5323). And next door to the north of The Green Dragon Tavern and Museum is a popular hamburger spot called Islands Restaurant. And across the street on the corner of Paseo Del Norte and Palomar Airport Road is a TGI Fridays (760-431-5009. They have great happy hour specials. Everybody’s favorite for a quick burger is Ruby’s Diner (15) at 5630 Paseo Del Norte (760-931-7829) in the Carlsbad Premium Outlets (15). Here too is a Panda Express (15) and an impressive place for a sit down meal in a country setting is Bellefleur Restaurant (15) (760-603-19191). 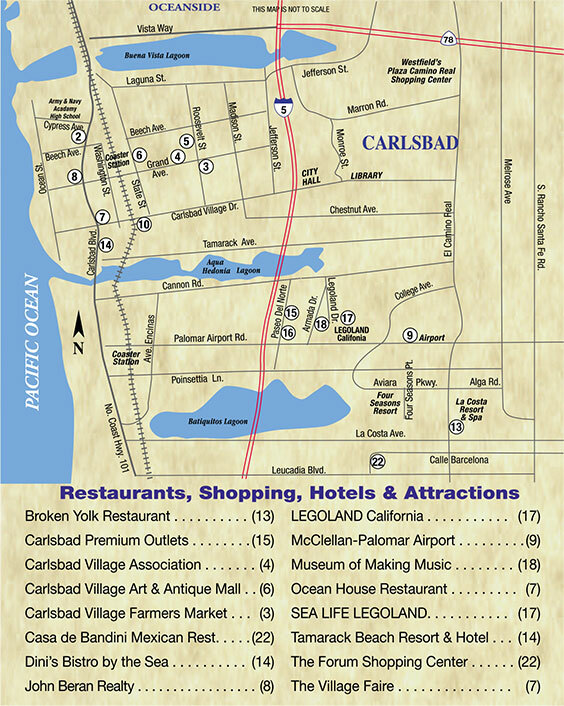 It’s at the northern end of the Carlsbad Premium Outlet Center and is well worth discovering. Everybody’s favorite is BJ’s Restaurant and Brewery at 5613 Paseo Del Norte (760-579-4440) for great salads and delicious pizzas and great tasting brews. Another pizza spot is Blaza Pizza at 5620 Paseo Del Norte (760-804-9027). Also across the street from the outlet center is a great breakfast spot is the Corner Bakery Cafe at 5617 Paseo Del Norte (760-4444-3105). Seafood lovers never tire of dining at King’s Fish House across from the outlet stores at 5625 Paseo Del Norte (760-431-3474). And right next door is a P F Chang’s China Bistro at 5621 Paseo Del Norte. This stylish, comfortable restaurant is hard to beat! For great destination dining, south Carlsbad is the place. You will be hard pressed to find a better selection of one great restaurant after another anywhere and they are all on the same thoroughfare.